Developing environmentally sustainable solutions for our customers is a focus for Downer. Our customers often look to us to deliver best practice options. We recognise that it is not possible to provide our diverse products and services without having some impacts on the environment. These generally relate to land, air, water and GHG emissions created from the activities we carry out for our customers. Downer is committed to developing solutions to reduce our energy consumption and GHG emissions associated with our operations and activities. We will continue to cultivate robust environmental management systems and resource efficiency programs to sustain our natural environment for future generations. Our environmental and performance commitments are outlined in our Environmental Sustainability Policy, our Management Framework and our 10 Environmental Principles. 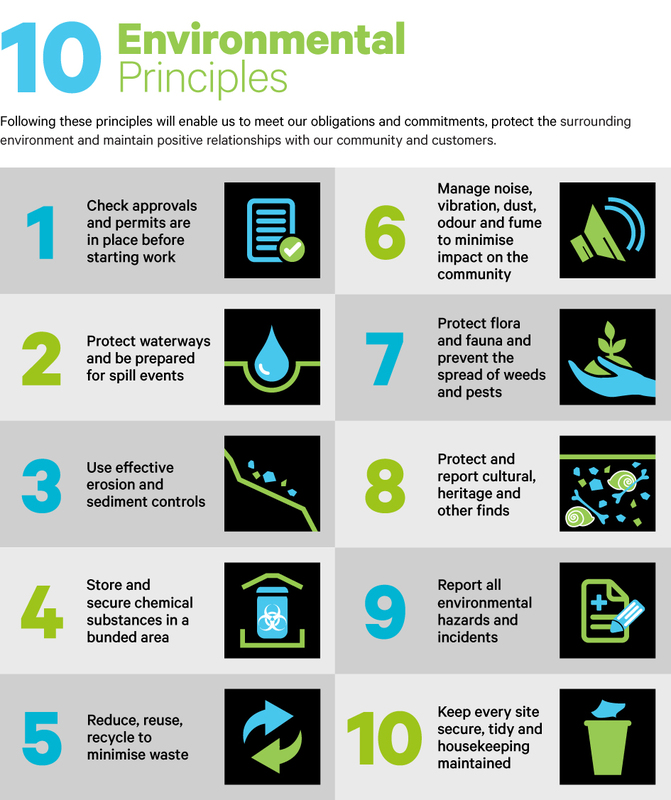 These principles are critical to ensuring our employees and broader stakeholder groups are engaged and aware of our environmental sustainability commitments. View our Pollution Incident Management Plans and Monitoring Data here. View our Pesticide Use Programs here. View our Environment Protection Licences here. View our ISCA Projects here.